Ridgid Power Tools- for Rugged, trouble-free performance! Ridgid with its set of dedicated professionals and illustrious heritage has been the expert in making ridgid power tools. Every tool has been engineered with high qualities of strength, endurance and ease of operation. They offer good safety, great reliability and performance. Ridgid Sawzalls are powerful reciprocating saw which are electric and hand-held and finds their use in the construction business. Reciprocating saw work by cutting the wood through a back and forth blade motion and is used for both horizontal and vertical surfaces. The built in speed variations help in the ease of cutting. Sawzall differ in their speed and power. They arrive in electric or cordless variety. The cordless are known for their convenience. An operator could pick different kinds of blades and also different kinds of batteries. 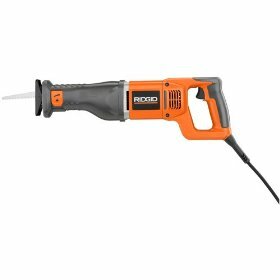 Ridgid Sawzalls could be used cut all wood products. May it be lumber, plywood, paneling, hard wood, these can be trusted. They can be used for cutting Masonite, plastic, drywall or metals like those of sheet steel, pipe aluminum, brass and copper. They come in handy with a good 3 year warranty for their tools. These tools come alone and the battery is not included. Let us consider the Dual Voltage reciprocating saw. This works with both 24V lithium-ion battery and 18V nickel-cadmium battery. The batteries are designed to give least trouble, but when they are worn out it could be recharged. The Variable speed switch trigger provides higher speed on an increased trigger pressure and vice versa. To prevent accidents, the reciprocating saw is equipped with a "lock-off" button. There are jobs that have low blade clearance. The shoe assembly could be adjusted forward or backward with one hand. To enable blade changes from happening faster, the tool free blade clamp feature, where it does not require a blade wrench to either install or remove the blade. The length of the stroke is 1-3/16inches. The pack comes with 2 blades and the speed is 0-2500spm. The Ridgid 11 amp heavy duty reciprocating saw is also one with all the above features. This model has an adjustable shoe for cutting stability. Ridgid also has a compact 18V One-handed reciprocating saw could be used while working in highly confined areas. It has a wonderful ergonomic grip with maximum comfort. The LED light that it accompanies is best to light darker areas. 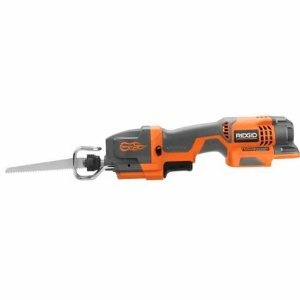 This saw also has the Tool free blade change, variable speed trigger. The cut is a 1/2inch stroke and is suitable when you have tighter clearances. The safety trigger lockout button though is not placed properly. There are Ridgid sawzalls which combine the reciprocating saw which comes with orbital motion also called Compact orbital reciprocating saw. In this saw, the orbital action rips the wood and the straight action cuts through metal. The main problem with Ridgid sawzall is that proper blades have to be used otherwise, it does not work continuously and throws out blades. The Ridgid Sawzalls makes it a pleasant and enjoyable experience for a construction worker. The Ridgid Sawzall is indeed a worthy bet! Return From the Ridgid Sawzall Page to Home - Finishcarpentryhelp.com.